Continuing with my BIO101 lecture notes (May 08, 2006). As always, please correct my errors and make suggestions in the comments. Cells do not exist in complete isolation. For a coordinated function of cells in a tissue, tissues in an organ, organs in a system and systems in the body, cells need to be able to communicate with each other. Each cell should be capable of sending chemical signals to other cells and of receiving chemical signals from oter cells, as well as signals (chemical or other) from its immediate environment. Cell membrane is a double layer of molecules of fat. Some small chemical messengers are capable of passing through the membrane. Most ions and most molecules cannot pass through the membrane, thus the information between the inside and the outside of the cell is mediated by proteins embedded in the membrane. Membrane proteins serve various functions. For instance, such proteins form tight junctions that serve to glue neighboring cells together and prevent passage of substances between the two cells. Other surface proteins are involved in cell-cell recognition, which is important for the immune response. Other membrane proteins serve functions in communication between the inside of the cell and the cell’s immediate environment. How does a cell send a signal? A cell can communicate signals to other cells in various ways. Autocrine signaling is a way for a cell to alter its own extracellular environment, which in turn affects the way the cell functions. The cell secretes chemicals outside of its membrane and the presence of those chemicals on the outside modifies the behavior of that same cell. This process is important for growth. Paracrine signaling is a way for a cell to affect the behavior of neighboring cells by secreting chemicals into the common intercellular space. This is an important process during embryonic development. Endocrine signaling utilizes hormones. A cell secretes chemicals into the bloodstream. Those chemicals affect the behavior of distant target cells. We will go into more details of autocrine, paracrine and endocrine signaling later on, when we tackle the human endocrine system. 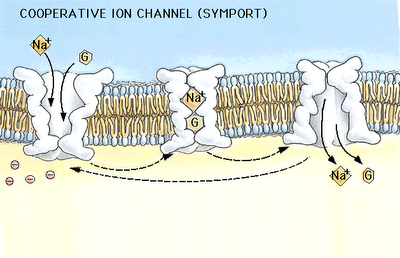 Direct signaling is a transfer of ions or small molecules from one cell to its neighbor through pores in the membrane. Those pores are built out of membrane proteins and are called gap junctions. This is the fastest mode of cell-cell communication and is found in places where extremely fast and well-coordinated activity of cells in needed. An example of this process can be found in the heart. The muscle cells in the heart communicate with each other via gap junctions which allows all heart cells to contract almost simultaneously. Finally, synaptic signaling is found in the nervous system. It is a highly specific and localized type of paracrine signalling between two nerve cells or between a nerve cell and a muscle cell. We will go into details of synaptic signaling when we cover the human nervous system. How does a cell receive a signal? 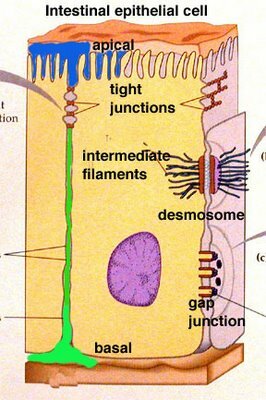 Some small molecules are capable of entering the cell through the plasma membrane. Nitrous oxide is one example. Upon entering the cell, it activates an enzyme. Some small hormones also enter the cell directly, by passing through the membrane. Examples are steroid hormones, thyroid hormones and melatonin. Once inside the cell, they bind cytoplasmic or nuclear receptors. 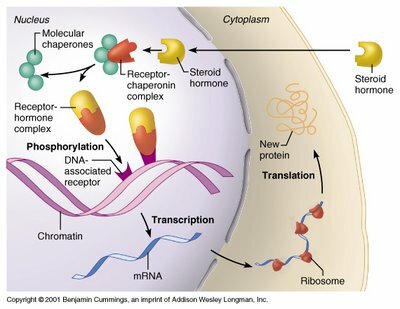 The hormone-receptors complex enters the nucleus and binds to a particular sequence on the DNA. Binding dislodges a protein that inhibits the expression of the gene at that segment, so the gene begins to be transcribed and translated. Thus, a new protein appears in the cell and assumes its normal function within it (or gets secreted). The action of nuclear receptors is slow, as it takes some hours for the whole process to occur. The effect is long-lasting (or even permanent) and changes the properties of the cell. This type of process is important in development, differentiation and maturation of cells, e.g., gametes (eggs and sperm cells). There are three types of cell surface receptors: membrane enzymes, ion channels, and transmembrane receptors. When a signaling chemical binds to the membrane enzyme protein on the outside of the cell, this triggers a change in the 3D conformation of that protein, which, in turn, triggers a chemical reaction on the inside of the cell. When a signaling molecule binds to an ion channel on the outside of the cell, this triggers the change of the 3D conformation of the protein and the channel opens, allowing the ions to move in or out of the cell following their electrical gradients and thus altering the polarization of the cell membrane. 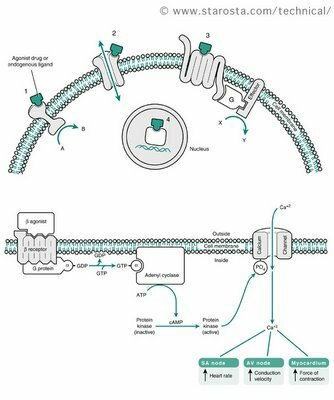 Some ion channels respond to non-chemical stimuli in the same way, including changes in electrical charge or mechanical disturbance of the membrane. 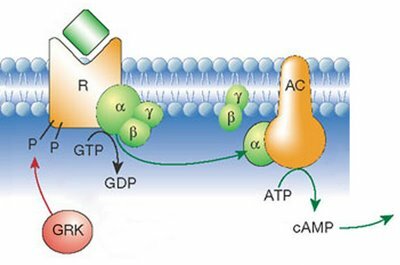 G protein-linked receptors are seven-pass transmembrane proteins. This means that the polypeptide chain traverses the membrane seven times. When a chemical – a hormone or a pharmaceutical agent – binds to the receptor on the outside of the cell, this triggers a series of chemical reactions, including the movement and binding of the G-protein, transformation of GTP into GDP and activation of second messengers. Second messengers (e.g., cyclic AMP) start a cascade of enzymatic reactions leading to the cellular response. This signaling method is quite fast and, more importantly, it amplifies the signal. Binding of a single hormone molecule quickly results in thousands of molecules of second messengers acting on even more molecules of enzymes and so on. Thus, the response to a small stimulus can be very large. We will go into details of G-protein-mediated signaling when we tackle the endocrine and the sensory systems. This entry was posted in Basic Biology, BIO101, Science Education. Bookmark the permalink.